Carlow's Poacher, O'Brien and Murphy. CARLOW HAVE APPEALED the suspensions imposed on Turlough O’Brien, Steven Poacher and Brendan Murphy to the GAA’s Central Appeals Committee (CAC) with their cases likely to be heard this week. Last week, manager O’Brien was slapped with a 20-week ban while coach Poacher and midfielder Murphy each received 12-week suspensions after all three were found guilty by the Central Hearings Committee (CHC) of showing “threatening conduct” towards referee James Bermingham at the end of their Division 3 round 6 defeat to Down. Carlow GAA confirmed to The42 that the trio lodged appeals to the CAC over the weekend in a bid to fight the suspensions which threaten to derail their championship campaign. The three men were initially charged by the GAA’s Central Competitions Control Committee (CCCC) with allegations of “minor physical interference with a referee” along with the lesser charge of threatening conduct. They sought a hearing to the CHC which took place last week where only the latter charge was proven and they were suspended accordingly. Video footage shows Bermingham being confronted after the one-point defeat to Down on 16 March when a free after the allotted period of second-half stoppage-time clinched the victory for the Ulster side. A draw would have secured Carlow’s survival in the third tier but a final round loss to Laois a week later saw them relegated to Division 4. 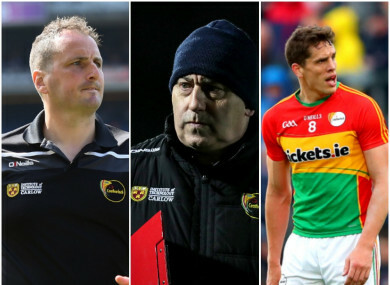 As it stands, O’Brien’s involvement would be precluded unless Carlow reach the All-Ireland semi-final stage, while Poacher and Murphy would be ruled out until 8 June – the night before the Leinster semi-finals. According to the letter of the law, suspended parties are not permitted to take part in training sessions although this is not always strictly enforced by GAA. If their appeal to the CAC is unsuccessful, Carlow’s final stop would be at the Disputes Resolution Authority (DRA) which operates independently of the GAA. Email “Carlow trio to fight hefty suspensions in front of appeals committee”. Feedback on “Carlow trio to fight hefty suspensions in front of appeals committee”.